Many authors invest a great deal of time managing their Twitter accounts. Hours a day are spent attracting new followers and keeping them engaged with pithy wisdom, personal minutiae and the occasional sales pitch. During a recent online conversation, with a social media marketing maven, I was told Twitter is great for increasing an author’s readership. I questioned the need for an author to use Twitter. I reasoned all the time redirected from honing one’s craft and sleeping was not worth the tradeoff. Sure Twitter is great for socializing, sharing celebrity gossip and sending messages to friends, but I’m not sure how effective a tool it is for garnering new readers. I believe there is an inverse correlation between the amount of time one spends on social media compared to the amount of time devoted to reading books. I doubt people who read at least one book or more, for pleasure, each month are very active on Twitter. I also so doubt if serious and successful authors spent much time on Twitter as well. So I did a little research and checked the Twitter stats for the most successful authors. Success, for this completely unscientific study, is defined by being on The World’s Top-Earning Authors, compiled by Forbes. As you can see from the graph (click image to enlarge) and the table (at the end of the article), 25% of the authors on the Forbes list don’t have Twitter accounts. 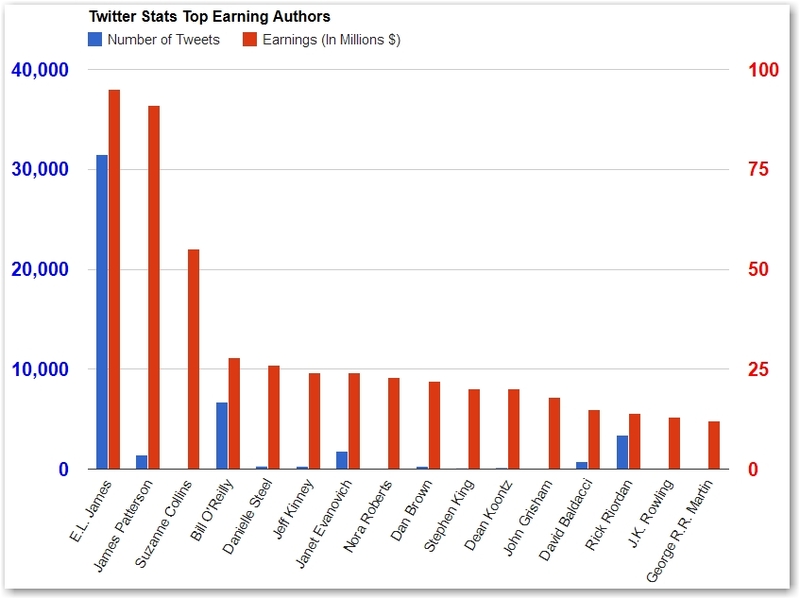 Ten of the 16 top earning authors have tweeted less than 325 times. With the exception of E.L. James, who is an aberration compared to her peers, most of these authors are not very active on Twitter at all. Ignoring the extremely large number of followers, due to the author’s celebrity, these twitter accounts are quite unremarkable. I’m sure someone is thinking, what does this prove? These authors are rich and famous; they don’t need to be on Twitter. I’d agree. I’ll also add that these authors used their writing and story telling talent to become rich and famous. Twitter had nothing to do with it. So why do some many writers dedicate so much time on Twitter? Part of it is perception; authors with a large number of followers are perceived, by many, as having a dedicated audience of readers. In reality, a large number of followers does not translate into a large number of readers and book buyers. It is not clear how many readers discover books via Twitter (Answer our quick 5 question survey and help us find out). How do your stats compare with the nation highest grossing authors who, ignoring E.L. James, have tweeted on average just over 1,000 times? As with most things online, the game is rigged. You can, for example, go to a site like Fiverr and hire someone to obtain Twitter followers for you. You can score a few thousand followers in just a day or two, for 5 bucks. I don’t want to know how they accomplish this task, but it does work. Another common way to increase Twitter followers is to use software that automatically goes out and follows others. Often someone, you follow, will follow you back. Later the software will go back an unfollow those that did not follow you back. Over time, you’ll end up with many more followers than you could possible generate on your own, but you also end up following a lot of other people too. If you ever see an account where a person is followed by 20K people and they are also following 20K people, this is usually a sign this technique was used. Both techniques can generate a ton of followers, but they won’t add much value to an author interested in attracting readers to buy their book. I experimented with these tactics and ended up being followed and following a bunch of bogus accounts, which opens you up to other problems, including the potential for an increased amount of spam. I used an application called ManageFlitter, which allowed me to remove all the bogus accounts, bogging down my Twitter presence. This is just the tip of the iceberg when it comes to enhancing your Twitter account; you can pretty much pay for anything. In fact, I use a service called twitterfeed which generates tweets on my behalf—most of the tweets are quite good. Basically twitterfeed allows me to query RSS feeds (a compilation of updates provided by a website here is the RSS feed for this Blog) and tweet useful information to my followers automatically—for free! One of my queries checks for African American books on Amazon. If it finds something that meets my predefined parameters it generates a tweet, with my affiliate code applied. I’ve earned commissions on book sales from tweets that were generated automatically. This article, for example, will be automatically tweeted. I often have to respond to someone who has replied to an automatically generated tweet. The vast majority of the time the tweet is a good one, but occasionally something gets tweeted that I personally would never have tweeted. Fortunately those are usually ignored. Indeed, many of tweets are ignored, disappearing forever into the Twittersphere. Despite that my Twitter engagement is quite high relative to the vast majority Twitterers. Someone asked me what percentage of my tweets are automatically generated. I honestly don’t know. But on any given day, the percentage of automatically generated tweets will range from 10 to 100%. I may miss a day tweeting, but my bots (automated processes) never sleep. Of course you can take advantage of Twitter’s offerings including Promoted Tweets, Promoted Accounts, and Promoted Trends. Paying Twitter ads directly can get expensive in a hurry and the impact, relative to other types of ad buys, is questionable for authors. If you are going to use Twitter the best way to grow your following is organically, interacting with others and tweeting interesting content. Unless you are a celebrity you are not going to grow your list of followers into the hundreds of thousands without using artificial techniques. As far as following thousands of people, that is pointless as well. No one thinks our friend @ArabicBest (in the chart above) is capable of reading the tweets of the 2.4 million people they are following. The data, and my personal experiences, suggest that Twitter is used by most people for the purpose for which is was designed; sharing humorous, mundane, silly, fleeting short messages with a group of friends; following the antics of one’s favorite celebrity; or quickly learning about some scandalous rumor or sensational news story. Below is the data used to compile the chart above. www.sysomos.com, www.forbes.com, www.beevolve.com, twittercounter.com, expandedramblings.com and of course twitter.com.